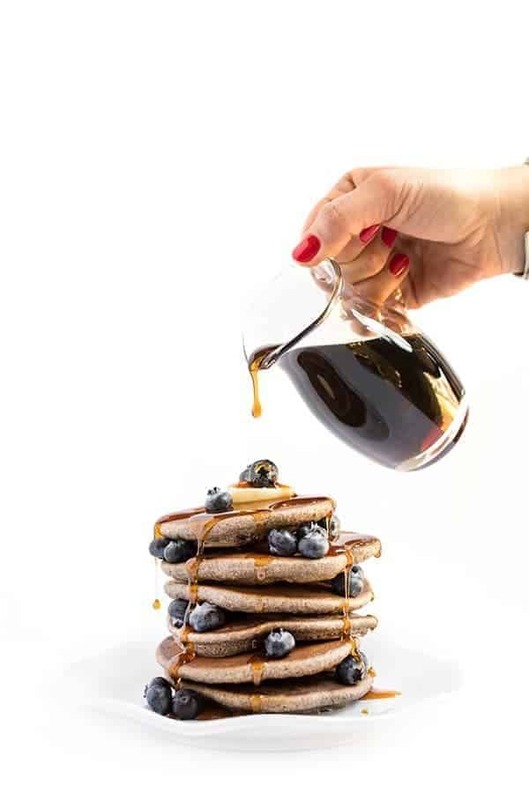 With over 18 grams of protein per serving, these protein packed pancakes will give you and your family lasting energy all morning long. As we near the end of February, I thought it might be a good time to check in and see how everyone is doing with their healthy living goals. Have you been cooking at home more? Getting active most days of the week? I’ve been working hard to kick the baby weight and so far, so good. I reached my goal for the month of January and I’m a pound away from my February goal. For me, making small SMART Goals throughout the process is key to avoid getting overwhelmed with long term goals. Less Confusion: Food labels are complicated these days. With clever marketing and buzz words like “all natural”, “farm fresh” and more, it is any wonder why people have trouble making smart food choices these days. By eating foods that come from the ground (i.e. apples, farro, Swiss chard, peanuts, etc.) or have a mother (i.e. eggs, chicken breasts, pork tenderloin, etc.) I can feel good about what I’m eating. You’ll notice that a carton of eggs doesn’t have an ingredients list and I like that. It takes out the guess work. 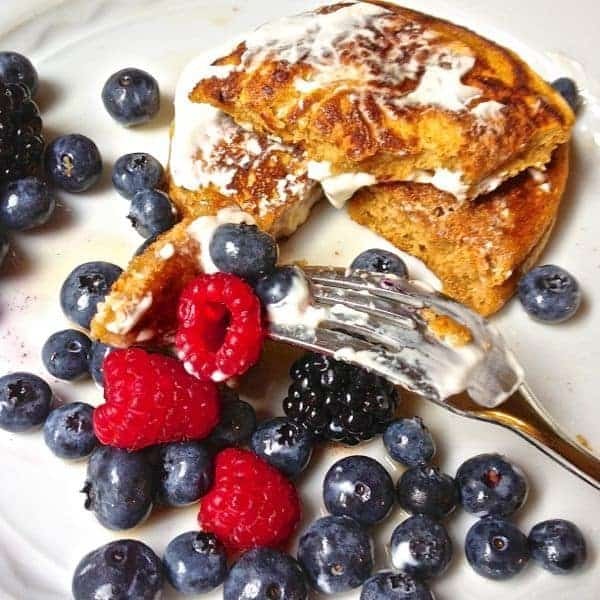 These Protein Packed Pancakes are a smarter choice than the traditional flap jacks because they get an added boost of protein from eggs and creamy ricotta cheese. If you’d like to kick up the nutrition even further, feel free to swap out whole wheat pastry flour for the all purpose flour. For a little added sweetness try tossing in berries, mashed bananas or shredded apples. The options are endless. Why do you eat clean? I’d love to hear what motivates you. 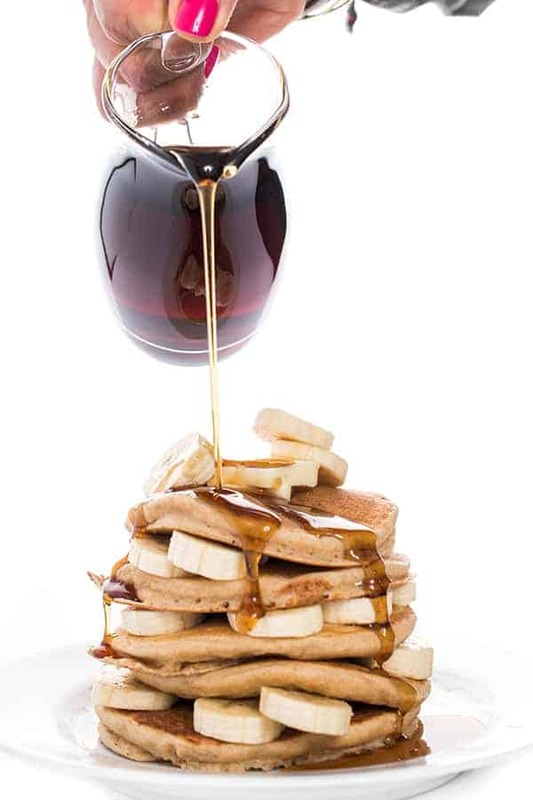 With over 18 grams of protein per serving, these pancakes will give you and your family lasting energy all morning long. Beat eggs, cheese, flour, oil, baking powder, salt and vanilla in large bowl until blended. Heat lightly greased large nonstick skillet or griddle over medium heat until hot. Spoon 1/4 cup portion of batter (1 tablespoon for silver dollar size) into skillet; Cook until golden brown, turning once. Photo and recipe are courtesy of The American Egg Board. I’m so glad to hear it!! Enjoy!! Great recipe. We make these all the time. So happy to hear it Andrew! love this recipe :) any thoughts on subbing some eggs whites instead of using 6 whole eggs? maybe 3 whole eggs and 3 egg whites? You can try it but I’ve never done that so I can’t speak to how they’d turn out! Loved this recipe, have made it twice so far. Now that I’m following Weight Watchers, how many pancakes per serving? I’m so glad you like this recipe!! It’s 1/4th of how many pancakes you end up with. Since everyone uses different sized scoops I’m reluctant to say how many pancakes total but if you end up with 12, it would be 3. If you end up with 8 it would be two. Does that help? 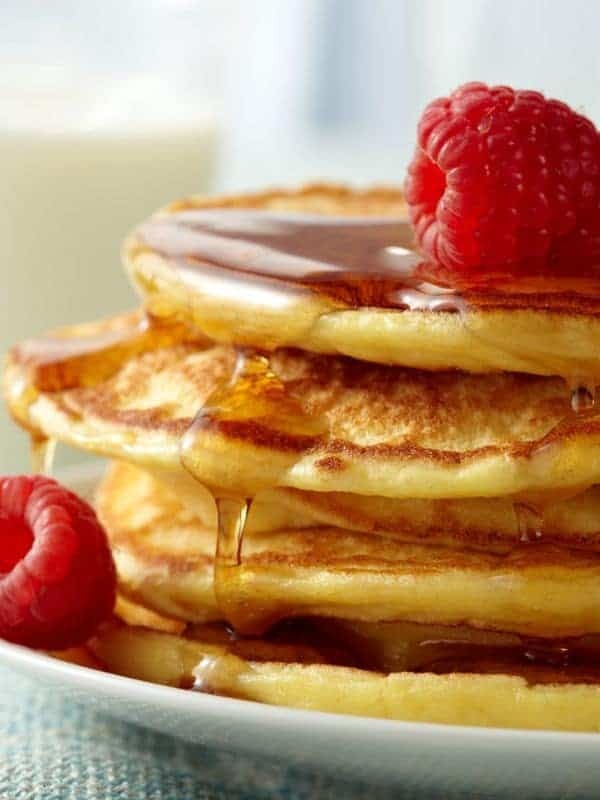 Just use 1/4 cup flour OR make the full recipe and freeze the leftover pancakes – they freeze beautifully! I love your recipe and will be trying this one out the next time I make pancakes! Looks delicious and I love that its packed with protien that is not a form or powder! I’m so glad you like this one Shelby!! I just made these for dinner with the addition of a mashed banana in the batter. I served them with sliced banana and fresh strawberries between the layers. Wonderful! I love to make pancake bites using a mini cupcake pan and an assortment of pancake fillers blueberries, chocolate chips, or turkey sausage. I then freeze them so we can pop a few in the micro on a busy morning. Do you think this recipe for batter will work well that way? I’d love to add the extra protein for my whole family. That’s a great idea!!! I bet it would – let me know if you try it! I love this recipe! I subbed in applesauce for the oil/butter, and they still turned out great. I’ll be making these often. Thanks for sharing! What an awesome idea! Thanks for letting me know! I am so grateful to have found you and absolutely LOVE everything I have made following your recipes. 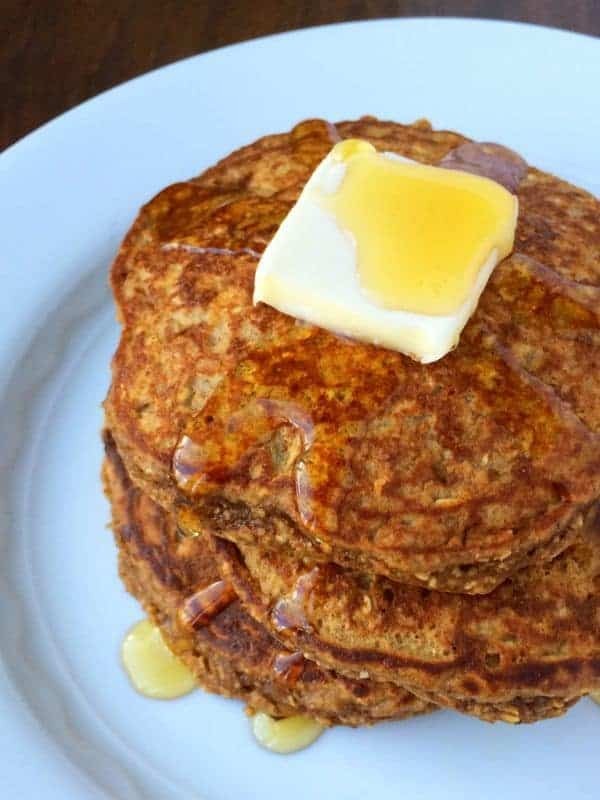 These in particular are the lightest most flavorful pancakes I have ever eaten…I eat clean because I can haha AND I love to bake and prepare meals that I can put my heart into for my family and myself. You have been such an inspiration to me, there isn’t a day that goes by lately that I am not eating something you inspired me to. A huge thanks for being You! Oh I’m so glad you found it!!! Glad you enjoyed them!! This look great. Is there a way to add oat bran to his recipe and decrease the flour? I try to do less gluten for digestive reasons and I’ve made oat bran pancakes there were fantastic. To combine both into a recipe with a high protein content and a good fiber would be even better. So glad they turned out!! 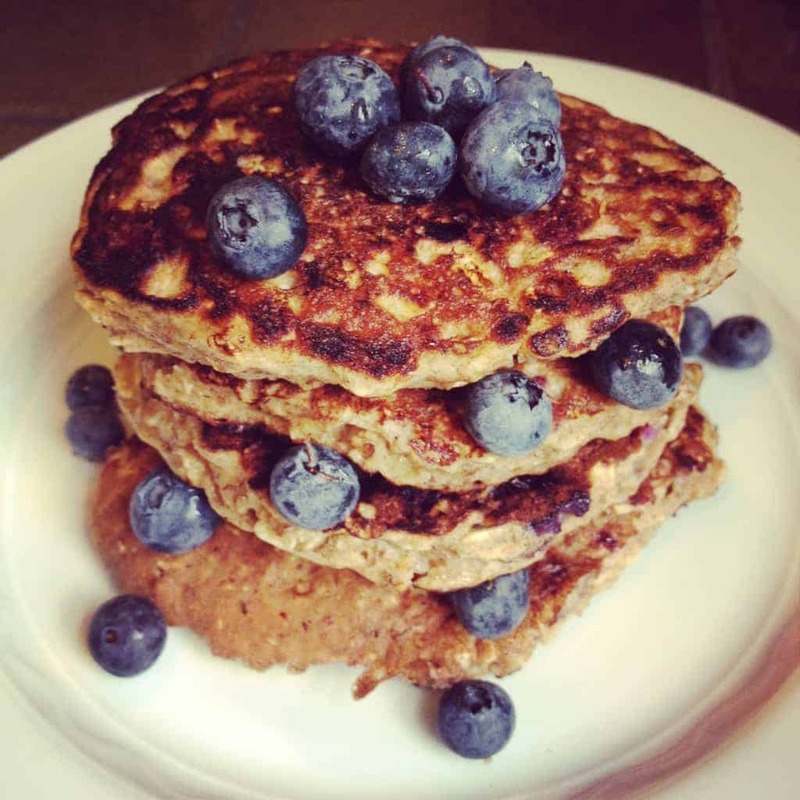 How could I ever turn down a gorgeous stack of flapjacks like THOSE!!! That picture is gorgeous!! Did you get a big girl camera??? Ok and I am pinning these pancakes for my very active teens that need lotsa protein! Great recipe. I eat clean most of the time, but once or twice a week I cave in a eat too much chocolate. This looks like an excellent breakfast for getting your day started on the right track! Thank goodness for pancakes!!! They bring families together – haha. I’ve been feeling kind of frumpy this February (V-Day plus my birthday will do that to a girl) so March is definitely going to be about making smaller, doable goals! Love this post. 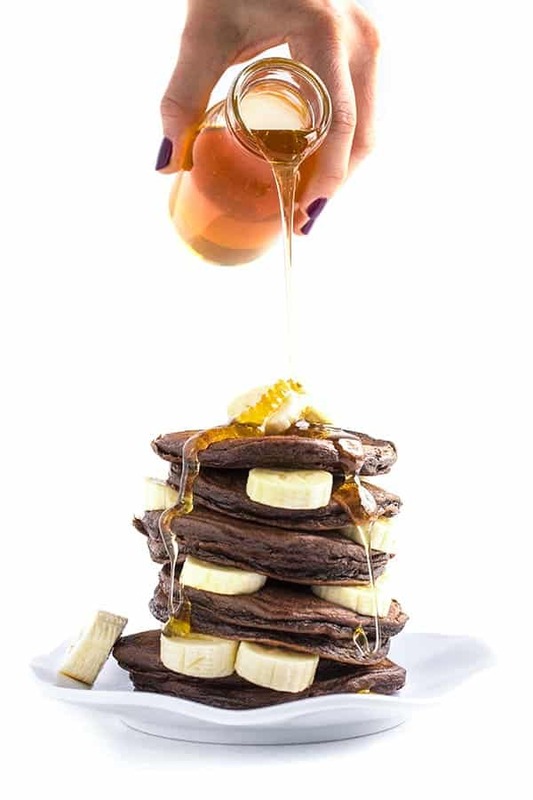 Clean eating is super important to me also, and I definitely will be whipping up a batch of these high protein pancakes! I eat clean (85% of the time) because it feels just instinctively right. Not only does clean eating improve my own health, it also improves the health of my community, farmers, farm workers and the earth. Eating well makes me feel more connected to my food and that’s fun! Love that I can have pancakes and still feel good about it! I am always looking for a perfect pancake recipe, and this has ricotta? Yes please! Ricotta makes them so fluffy! My little girl LOVES pancakes. Unfortunately, she also has a ginormous sweet tooth. So getting her to eat healthy is a tricky job. LOVE the idea of getting protein in her via one of her favorite breakfasts. Will make these for her sooN! I also love adding fruit to every pancake I make!! Shredded apples, mashed bananas, berry compote topping – you name it! Let me know what you think if you try them! I eat clean because it truly makes me feel good! I appreciate clean eating even more when I treat myself with something that I don’t eat everyday (chips, pizza, ice cream) and it has become easier and easier to get back on track after so many years of training my habits to make healthier choices. 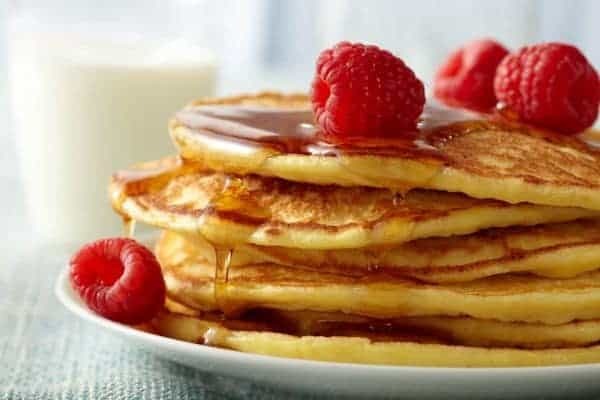 These pancakes look amazing! You are the pancake queen! Isn’t that the truth?? That’s why I think the splurges are always a good idea now and again! Congrats on hitting your goals! I’m loving these pancakes. I’ll use any excuse to eat cheese for breakfast. Thank you so much Annie!! Wow!!! These look amazing–never would have thought they would have this much protein and loved how you did it with eggs (one of my favorite foods). AND ricotta!! Yum. The ricotta is KEY for light and fluffy anything!